What Does Sliced Invoices Do? 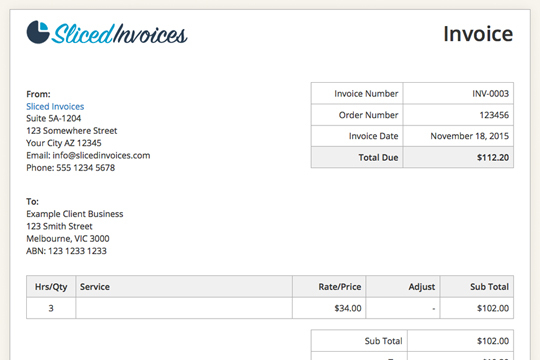 In a nutshell, Sliced Invoices is a free WordPress invoicing plugin that allows you to send invoices & quotes to your clients. And with a range of free and paid extensions available, all of your invoicing needs are covered. You can have a quote out the door and sitting in your clients inbox within minutes, all without leaving your WordPress dashboard. Pre-defined items and a smart user interface make creating quotes or estimates a breeze. Once your client accepts your quote or estimate, it is simply a matter of clicking the ‘Convert To Invoice’ button and you now have an invoice ready to go. Send your client the link and they can pay online using PayPal. 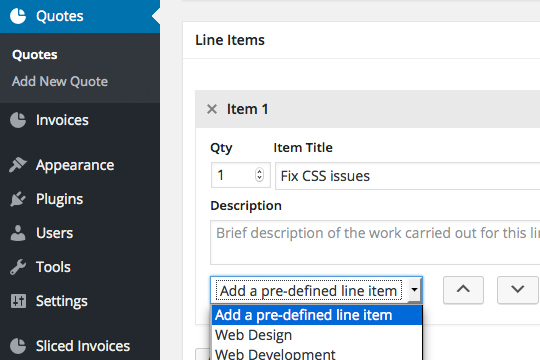 Create unlimited pre-defined line items for fast quoting & invoicing. Accept credit card payments from your clients via PayPal. Receive nicely formatted HTML notifications when you are paid. Design your own invoices & quotes or use a pre-designed template. Get an overview of current & past income and quotes. Sliced Invoices is ready to translate into your language. Export quotes & invoices in CSV format ready for Excel. Set a global tax rate and/or a rate per line item. Manage your client details just as you do WordPress users. Check out the free and paid extensions available for Sliced Invoices that will help make your quoting & invoicing a breeze. Some of the extensions include the Email & PDF Invoices extension, Translate, Recurring Invoices and Deposit Invoices. There are a number of bundles available that include multiple extensions & priority support options. Bundles are designed to offer the best value for money & there can be some serious savings to be had with some bundles saving over 50%. Easily customize your invoice & quote templates by choosing a pre-designed template, adding your own CSS, creating your own invoice & quote templates or use a combination of them all. Add your logo, add footer text, format addresses anyway you like and depending on your HTML and CSS knowledge, you can style the invoice or quote literally anyway you like. The reports page shows you a monthly and year to date overview with such things as total invoices, total quotes, total amounts paid and unpaid, highest/lowest/averages as well as a graph of invoices vs quotes for the year to date. You can also export a list of all quotes & all invoices into a CSV format Excel file. Perfect for the bean counter! Besides all of the fancy stuff like designer templates and good looking reports, there are tons of tiny little features built into Sliced Invoices that will make your invoicing & quoting a breeze. Built in features include multiple payment methods, pre-defined line items, any currency, any language, translation fields, client management, convert quotes to invoices, clone items, auto increment of numbers and the list goes on. 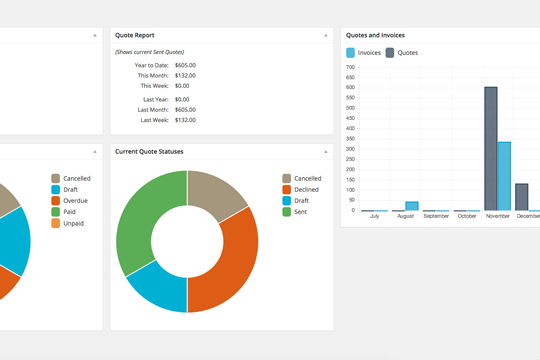 Creating invoices & quotes in the WordPress admin area has never been easier. Customize your invoices, manage your clients and accept payments securely online.